Beeks Financial, which went public roughly 15 months ago, said that for the six months ended December 31, 2018, revenues increased 36% to £3.5 million. 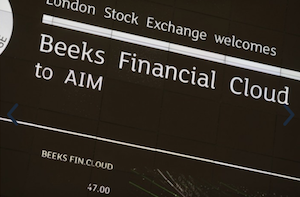 Beeks reported first-half underlying profit before tax up 46% to £0.41 million and is proposing its maiden interim dividend of 0.20p. Beeks is a provider for automated trading in foreign exchange, futures, shares, bonds and cryptocurrency financial products. Beeks Financial CEO Gordon McArthur said: “We are pleased to report on a steady first half performance, in which we have delivered both revenue and profit growth, while expanding our geographic footprint and service. “With the expected launch of Brazil later this year, we will have a footprint in all the key trading centres around the world and we continue to evaluate new locations to deploy our low latency Cloud. “Signing our first Tier 1 organisation was a major milestone for the group as it demonstrates our growing capabilities, and as we move into the second half of the year, our focus will be on expanding our institutional customer base both for hybrid cloud management and our core low latency offering. “This is a good first half performance, during which 99% of the group’s revenue was recurring.